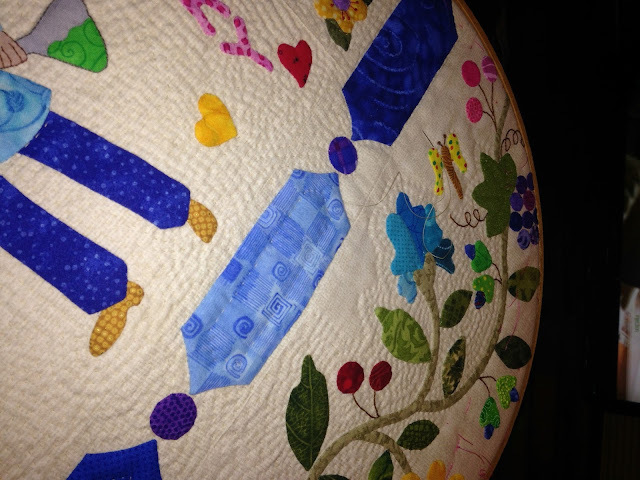 The hand quilting is progressing...hoop-full by hoop-full. I finally got around to cleaning up the scraps and snippets left over from basting the layers and realized I used a "Quilter's Dream Cotton - Select" batting remnant. I wanted the applique motifs to really "pop" prominently. I really like hand quilting with a "Request" weight batt...it is easier to make finer stitches. But now that I am using this thicker weight batt I am having to just do the best I can. I have all the center squares and first stop border done, so now I am concentrating on the second and outer borders. The center of the quilt (all blocks plus both skinny inner borders) is 1936 square inches to quilt. The outer border alone is 1428 square inches. I have learned not to get to excited about finishing the middle of a quilt because those outer borders encompass quite a bit of real estate themselves, LOL! 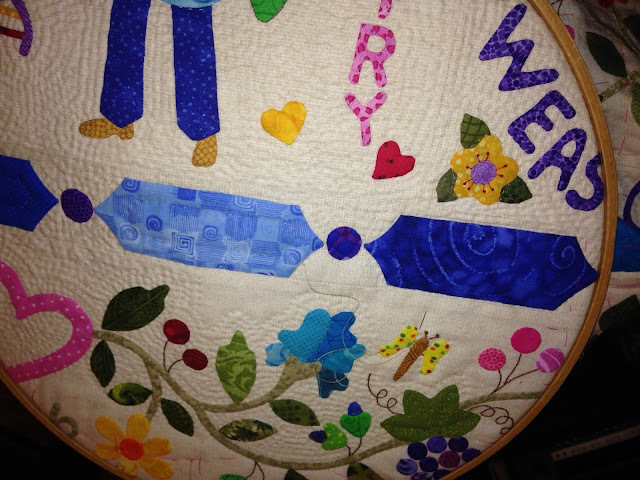 I have got to go back and do a little more decorative fill quilting on the larger applique motifs. Even though the green blouse, below, is only about 2.5 x 3 inches, it looks a little wild and crazy without some tiny motif stitched in there. The background is so tight with the fill stitching...I don't like the overly puffy look of some of the larger applique pieces so I am trying to quilt them creatively. I like the surface of the quilt to be fairly uniform. This is what I woke up to on Sunday morning. I know some of you are getting much worse right now, but this is definitely weird for Alabama in mid March. It was so weird to see the blooming daffodil clumps sticking out of the snow. We may get some more this week. My blueberry bushes were blooming last week. I hope the below freezing temps on Tuesday and Wednesday nights don't kill this year's berries! Stay warm and stitch, all you snow birds! Fabulous stitching as usual. You just amaze me. I hope your blueberries don't freeze too. one year the cold weather killed the crop of blueberries at my brothers farm - the buds were set I don't know how much further the progress had been on them but he lost almost the whole crop - hope that won't happen for you - I don't remember how cold it had gotten. 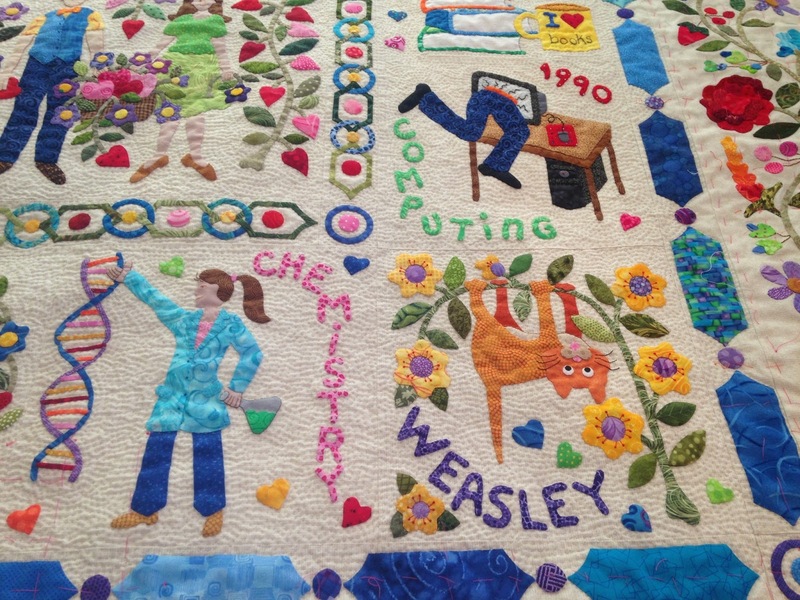 The quilt is looking great, you sure are putting a lot of quilting in it. I cannot believe how fast (and perfectly) you applique little pieces, but OMG!! I can't believe how fast you quilted all those little stitches and spaces - incredible!! What a labor of love that quilt is!!! What a beautiful quilt and the quilting is meticulous. You are making great progress on your quilting. It is beautiful. 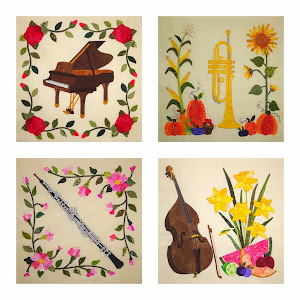 I think you are right about making the quilt surface more uniform with your quilting stitches on the appliques, but you are a master quilter so this isn't a problem for you. What fun looking at all the memories of your life. Wow. Your quilting is amazing. Just beautiful. Hope the blueberry bushes still produce for you. Amazing! You must enter it in our show this Fall. Great progress! Love that texture you are creating! We didn't get as much snow as predicted, but enough to make driving/living hazardous. OMGOSH! Amazing! I am partial to Weasley's hanging upside down image since I am a "crazy cat lady" of 6 rescues. They all "help" me quilt too! Our friend Deb from Frugal Little Bungalow sent us over to drool! AMAZING!!!!! That quilter's dream select is much tougher to quilt through than request! 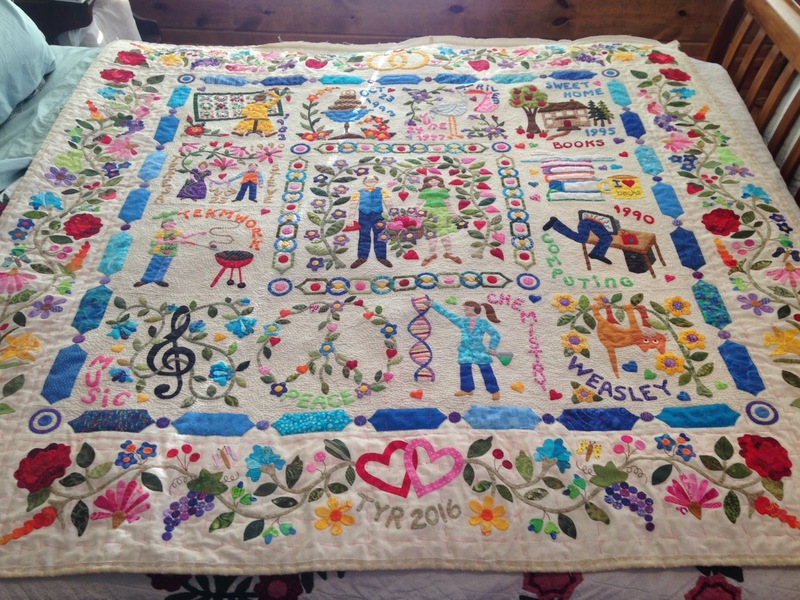 Your quilting looks amazing!! Wow, your 'Contentment' quilt is awesome! 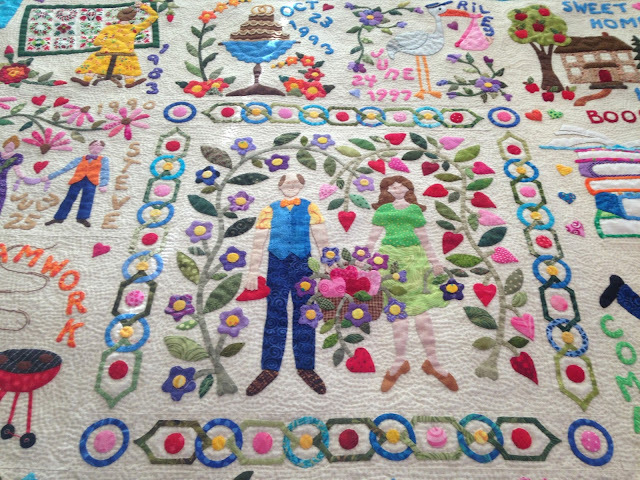 It looks so fascinating, and your quilting is wonderful! You are a rocket ship! Amazing progress. 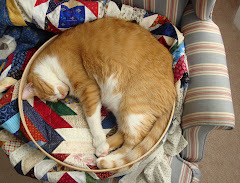 I must say I do the same thing when I finish the center of a quilt and think I am halfway done. I love your term "lots of real estate" in those borders! 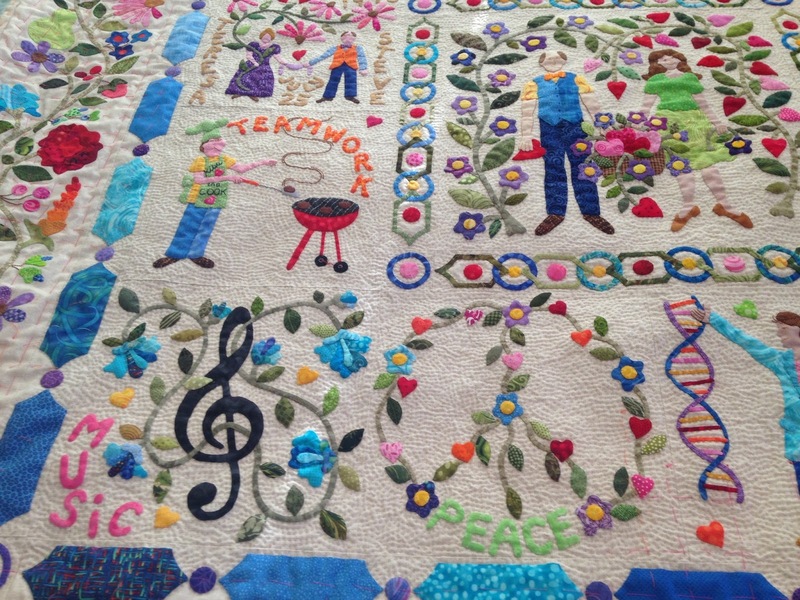 This quilt is so marvelous. I do hope I get to see it in person soon. If it makes you feel any better, I had to shovel my way through 18" of that white stuff before I made it into work this morning. Even for Maine, that is quite a lot to deal with considering spring is only 6 days away! This quilt is looking awesome! I hand quilted a small quilt (Jacobean garden) using the hand stippling method. OMG! took a llllooonnnnnggggg! time. I know what you mean about the unquilted parts plumping up. My woolen flowers do that. Every time I look at it, I think about going back and stitching those down. Hi Teresa, Yes. It was me who inquired about the batting. Coincidentally, at the time I had recently chosen batting for my quilt. I was limited by what was available locally in a bleached white. Initially, I purchased cotton batting off the bolt at Joann's, and after basting I decided it was too stiff (gasp). Therefore, I unbasted it as I knew I would be not be satisfied. My local store had Dream Select (80-20). It is working out well, however, the majority of my quilt is being machine quilted for various reasons. I also need to label my batt scraps as it is easy for me to get confused on such an important quilt choice. I am also tweaking some of my quilt embellishments because if I don't it will bug me forever ��. Thanks for the batting update.